From the makers of America's #1 Kids Gummy Vitamin Brand! L'il Critters™ Probiotic is a great tasting daily supplement that combines 1 Billion CFUs with a prebiotic in every serving to help support your little one's digestive system. * It helps support digestive health by providing good bacteria to the digestive tract. * L’il Critters™ Probiotic is infused with delicious fruit flavors and has probiotic strains that survive the stomach’s harsh environment. 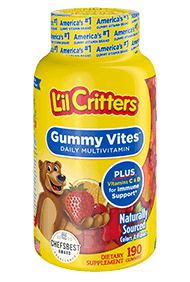 Like all L'il Critter™ vitamins, L'il Critters™ Probiotic does not contain any high-fructose corn syrup, gluten or synthetic (FD&C) dyes. Natural Cherry, Orange, & Grape flavors.